Summary: Millennials may not see the need for estate planning just yet. But as Siedentopf Law explains, having documents in place that protect yourself and your assets are important at any age. Millennials, the generation born between the 1980s and mid-1990s, may not see the need for estate planning just yet. But having documents in place that protect yourself and your assets are important at any age. According to a recent Caring.com survey, 78% of the U.S. population aged 36 and younger do not have a will or a trust in place. This might be due to the millennial approach to life experiences and timelines. Millennials, more so than previous generations, are more likely to focus on their education and career over marriage and family. This means that they are experiencing the milestones that typically trigger estate planning (ex: purchasing a home, getting married, having children) later in life. While millennials may delay marriage and home buying, they are usually very cognizant about financial issues. They are a budget-conscious group who try to avoid incurring large consumer debt. Millennials also tend to have more assets than they realize. Many may focus on their student debt; however, millennials typically participate in retirement accounts and life insurance policies. They also have tangible assets such as real estate, home furnishings, electronics, vehicles, and/or jewelry. (For more on estate planning and digital assets, you can read our blog Dealing With Digital Assets in Your Will and Power of Attorney). Estate planning gives a person the opportunity to decide and stipulate what will happen to them and their assets if they are incapacitated or pass away earlier than expected. It is an unpleasant reality that incapacity can occur at any time, but you can save your family and loved ones unnecessary stress by having a plan in place as well as giving them the authority to make certain decisions on your behalf. A durable power of attorney, for example, is a document which identifies who will make financial decisions on a person’s behalf if they are unable to do so. In Georgia, a spouse gets automatic medical power of attorney, but not financial power of attorney. Long-term partners and boyfriends/girlfriends do not automatically get any powers of attorney. It is also a good idea to have an advance directive for health care in place. This document, which is Georgia’s medical power of attorney, designates who should be the medical power of attorney and outlines a person’s preferences for medical care if they are unable to state those preferences for themselves, whether due to sickness, injury, in incapacity. For more about Georgia’s advance directive for health care, you can read our blog Navigating the Georgia Advance Directive for Health Care. In addition to power of attorney and an advance directive for health care, millennials want to consider having a will or a trust in place. These documents provide instructions for the distribution of a person’s assets upon his or her death. The executor of the will, also known as the personal representative, will help ensure that an individual’s property is passed to the beneficiaries according to his or her final wishes. Another recommendation is beneficiary designations on any life insurance policies, 401Ks, and/or bank accounts. These types of accounts usually comprise the bulk of a millennial’s assets, so it is important to have a mechanism in place for the access and transfer of those assets. Once a person names those beneficiaries, it is also a good idea to periodically update and review those designations. Estate planning is a long-term relationship, whether that relationship starts at a younger age or later in life. Once you have a plan in place that protects yourself, your assets, and your loved ones, you should revisit it to ensure it fits with your current familial status and goals. 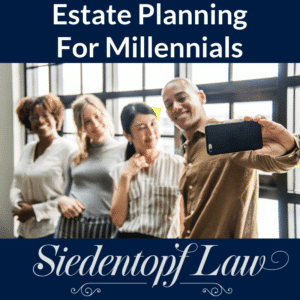 For more about estate planning for millennials, or if you would like to set up an estate planning consultation, visit the Siedentopf Law website EstateLawAtlanta.com or call us today at (404) 736 – 6066. ← Video: Do Spouses Have Automatic Powers of Attorney For Each Other?